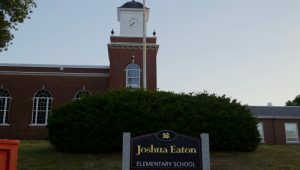 A report received from United States Office of Civil Rights (OCR) investigating alleged civil rights violations at Joshua Eaton Elementary School during the 2014-15 and 2015-16 school years was presented to the School Committee at its September 25 meeting. The report determined that in some cases the rights of students had been violated. The report written following the investigation by the OCR of complaints that the Reading Public Schools violated the civil rights of two students with language learning disabilities at Joshua Eaton Elementary School. The complaints were initiated by the parents of two students in the Joshua Eaton bridge program in June 2016, following offenses alleged to have occurred during the 2014-15 and 2015-16 school years. Carolyn Wilson, Reading Public Schools Director of Student Services, presented the OCR report to the Committee. The report broke down the alleged offenses that into several areas. The first complaint alleged that the space at Joshua Eaton that was allocated to the bridge program was inferior to that which students in the general school population were able to use. Per the report, at the time of the allegations, the bridge program shared a classroom with the school learning center using dividers that did not reach the ceiling to divide the space. This allowed noise from each program to affect the other. There also was no access from the bridge program side of the room to the hallway, requiring students from the program to pass through the learning center space if they needed to leave the room. The complaint stated that no general student classroom had this situation and that students in the learning center could potentially observe what students in the bridge program were doing, potentially opening bridge program students to ridicule. An inspection by the Massachusetts Department of Elementary and Secondary Education (DESE) in February of 2014 found no fault with the space, however, the OCR investigation determined that the space was indeed substantially different than what was offered to general population students and that student progress was more than likely affected by the arrangement. The second complaint alleged that aspects of a student’s Individual Education Plan (IEP) were not followed by the district, preventing the student from progressing at an acceptable rate. The OCR found insufficient evidence on two of the allegations, but affirmed that there had been denial of free and appropriate public education on two others: a quiet and non-distracting environment as a result of the classroom set-up and that only half of the student ’s specialized reading instruction was given by a special education teacher and the rest by a para-professional, despite the IEP being specific that the instruction by done by the special education teacher. The third complaint alleged that a second student’s IEP also was not followed by the district. Insufficient evidence was found to substantiate one of the allegations. Another allegation, alleging that the student did not receive instruction from the special education teacher from May 25, 2016 through June 21, 2016 could not be determined due to lack of documentation. Two allegations were determined by the OCR to have occurred. The first was that the student’s IEP stated that a specific reading program, Lexia, was not to be used by the student while at school, yet OCR found that it had been. The second also had to do with the lack of a quiet and non-distracting space that resulted from the classroom arrangement. Again the OCR found that there had been denial of free and appropriate public education to the student. Several parents spoke out at the meeting, expressing frustration that these issues have not been addressed sooner, asking for more careful oversight of the special education program by the school committee. Bennett’s statement called upon the School Committee to form a task force to review the needs of students with language learning disabilities and to help address the issues the district faces in the area. School Committee Chair Chuck Robinson promised that the idea of a task force would be looked at by the Committee and administration. Parent Alicia Williams also commented the “There is a large body of students affected” by the issues and suggested entrance and exit criteria for the bridge program, so progress could be measured. Wilson responded that there are guidelines in place for entrance and exit in the program that are being revised and will be made available when completed. The Committee also reviewed how the district is addressing findings in the special education program, mostly in the area of monitoring, from a mid-cycle review by the DESE. New special education management software has been implemented that should address most of the concerns. The Committee’s meeting adjourned at 9:55 p.m.